Changes in women’s breast shape and size can be attributed to many different factors such as nursing, weight gain and loss, and aging. Oftentimes in these cases, women will lose their youthful size and volume in exchange for sagging, drooping breasts. Depending on patient needs, Dr. Mountcastle may recommend a Breast Augmentation with a Breast Lift to achieve a younger, shapelier appearance to help best restore their look. The implant portion of the surgery will add volume, especially in the upper pole area of the breast. The implant also aids in helping even out the breasts and giving them symmetry. The Breast Lift allows for areola reduction and placement, reshaping of the breast and excess skin removal. The combination surgery is less common than a Breast Lift or Breast Augmentation alone, due to its unique criteria that must be met by patient’s current body and health state. After a full assessment, Dr. Mountcastle will determine whether a patient is a fit candidate to move forward with this procedure. Generally, patients who are interested in this type of procedure are looking for both a lift and more volume. Patients should be prepared that this procedure results in more scarring than a Breast Augmentation alone, but result in the same scarring as a Breast Lift. However, scarring will fade over time with the use of silicone scar creams and proper post-operative care. Patients go under general anesthesia for this surgery that will be performed in the hospital. For this type of procedure, Dr. Mountcastle uses an anchor incision around the areola down to the inframammary fold and across the bottom of the breast, where he will be able to manipulate the breast for both procedures. He places implants subpectorally (under the muscle) to achieve the most natural look. Multiple layers of sutures are placed to ensure proper healing. Most sutures are underneath the skin and are absorbable. 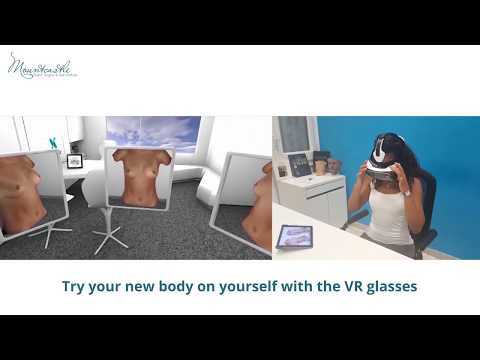 Patient’s will come in to visit with Dr. Mountcastle and be assessed for the appropriate treatment plan utilizing cutting-edge VR technology. Patient’s will discuss their surgical goals and desired size range of implants during this time. Once patient books their surgery, they will return to the office for their pre-operative appointment. During the pre-op appointment, patients will be informed on what to expect before, during, and after surgery, perform a secondary size range for potential implants, and have an opportunity to ask Dr. Mountcastle any questions they might have. Patients will also be provided with the prescriptions required post-operatively. For most patients, this procedure is generally an outpatient procedure, but patients do need a ride to and from the facility. Dr. Mountcastle likes to see patients 48 hours post-operatively to change the dressing and place the surgical bra. How do I get my surgical bra ? The hospital will provide patients their surgical bra. The bra will not be needed until your 48-hour post-op appointment. There is no additional cost for the bra. What is the Healing Time ? The healing process is a similar healing process to a breast reduction. This is a soft tissue surgery with no muscle involvement resulting in quicker healing times. It does require limitations to heavy lifting for approximately 2-3 weeks. Should I get breast massages ? Depending on the healing time, patients are instructed to perform self-administered breast massages, and patients will be given these instructions during their pre-op appointment. We also follow up with this regimen during post-operative appointments.